Today we are featuring the set called "Beach Party"
so I used a water brush to blend in the colors. Back tomorrow with Day 3 of the July Reveals! Ciao! Love the beachballs with their bling centers. The embossing is great and the alligator is colored so nicely. Fun card. LOVE this, so colorful and the row of beach balls was a fabulous idea!! I love the beach theme. So fun. Love the bright summery colors on this super fun card!! EEkkkk!!! This is so fun and so festive! Love all the circles!! Super cute! LOVE your TERRFIC card. LOVE those colors together. Thanks for sharing. Such a fun card! Love your colour scheme and your beautiful colouring! I really like how you made the beach ball border! Awesome stitching too! That cool alligator, the embossing, the stitching, the bright colors...OH MY! What fun colors--love the row of beach balls. I have been so excited to see what day 2 would be like - what a fun stamp set!! You made such a cute gator card!! Love the beachball border - each one with an enamel dot, so clever!! Love the stitching and the rounded corners!! What a fun and clever card!!! Such a fun card! Love the stitching and all those cute beach balls! Just love the summer colours on this card, the embossing and the cute line of beach balls. Wonderful card, love the colours, super fresh! that's it! i'm in love with your card!! the stitching is amazing! wow!! and the coloring - i have never seen Faber-Castell Aquarelles before - but i already know from your card that i love them!! the coloring is super sweet and i LOVE that line of beachballs!!! what a perfect card!! Cute set! Love your card! 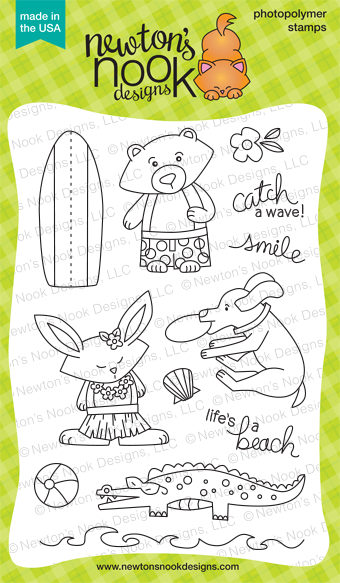 This is so fun - the coloring is so pretty and I just LOVE that row of beach balls! Makes me smile! After the day I had this card made me laugh with the sentiment and critter. I love your colors and the coloring! Such a summery, beachy feel! I love the beach ball border and that alligator. Super super cute card!